Ingredients for cooking Fruit Salad This dish is one frequently served by our good friend Alice as part of a late breakfast on Sunday monings (after a late Saturday night!). Delicious! Also good as a sweet dish with lunch or dinner. This fruit salad is characterised by what it doesn't contain. There's no apple (which I find a bit hard and tasteless), no banana (which goes a bit slimy all too quickly) and no melon (because I don't particularly like it!). First, prepare a fresh pineapple. You have to slice off the top and bottom, then cut off the prickly outer skin. Then, cut into slices, and cut out the tough centre from each ring. Then, slice each ring into pieces. This is all quite a lot of faffing about, and I prefer to use a great Cooking for Men gadget - a pineapple corer. This looks like a cross between an oversize corkscrew and an apple corer. 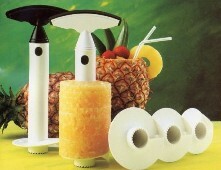 Just cut off the leafy top of the pineapple and screw in the device - it does all of the work for you. Put the prepared pineapple in a large bowl, with any of the juice you have managed to save. Prepare and add the following additional fruit: 250 grams of washed strawberries, tops cut off and sliced in half; 250 grams of washed raspberries; 100 grams of washed white seedless grapes and 100 grams of washed red seedless grapes. Mix very gently with a large spoon. Serve in small bowls. You might care to add a little cream, yogourt or creme fraiche. The rest of the salad will keep (covered with clingfilm) in the fridge until tomorrow.